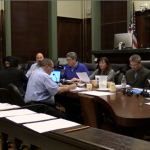 However, Bhalla countered by stating he was in high school when the last Suez contract was negotiated with Hoboken and said DeFusco was playing politics by bringing up such an issue during public session. “I’m happy to recuse myself immediately, pending a legal opinion. But let’s stop with the political nonsense,” Bhalla responded. 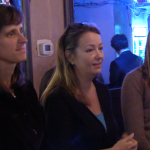 “Councilman, it’s not political nonsense,” retorted DeFusco. 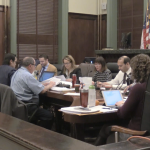 City Corporation Counsel Brian Aloia indicated that Bhalla had every right to abstain before the presentation began, but said he could not give a legal opinion since he had not had time to refer all the circumstances at hand. DeFusco was more than happy to provide more information for Aloia on the spot. “Corporation counsel, for your view, I’d just like to provide you with a printout from Florio Perrucci Steinhardt Fader’s website – which, although Councilman Bhalla says was a partnership while he was in high school, as he so proudly proclaims that their client is Suez Water Incorporated,” stated DeFusco, who represents the 1st Ward. Bhalla then expressed shock that the matter continued to be an open discussion on the dais. “Well that was obviously a political setup. We are sort of in silly season. The professional way to have done it would be to raise the issue privately with the presence of corporation counsel, rather than publicly embarrass a colleague,” expressed Bhalla. 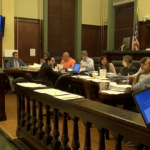 The council was expected to vote on a multi-million dollar contract with Suez that would extend their agreement with the city through 2034, however, the governing body opted to pull the measure when various questions arose throughout a 40-minute presentation on the subject. 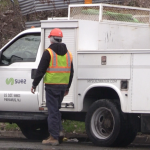 Mayor Dawn Zimmer has previously stated that the new contract would come with $40 million in benefits to the city and Suez would also forgive them for $10 million they are owed. Although Bhalla was adamant he had no part in the Suez negotiations with the city, DeFusco continued to chip away at his political adversary. 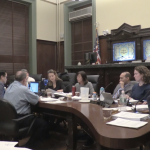 “Ravi Bhalla’s failure to disclose that Suez is a client of his law firm at this moment when the City Council must decide on a decades-long agreement worth tens of millions of taxpayer dollars is the antithesis of transparent government,” DeFusco said in a statement. The Hoboken mayoral race isn’t until November 7th, so the subsequent fall meetings of the city council are all but guaranteed to provide similar fireworks. Name calling is the law firm partner’s forte. Bhalla supports secrecy and opaqueness in government. I can attest picking up the phone with Councilman Bhalla is an exercise in futility. And in the end Ravi is recusing himself. But not before he threatens to sue anyone who questions his conflicts.